In every market segment there are tools that costs several times as much as the entry level version. I often wonder what the reason for such a steep price premium could be. In the world of circular saws one of these tools is the DeWalt DW364. Called "the finest circular saw you can buy" by many professionals I have come across, it was inevitable that it would find its way into the Hingmy shop. Let's take a look, if the DW364 is really that much better than the competition. 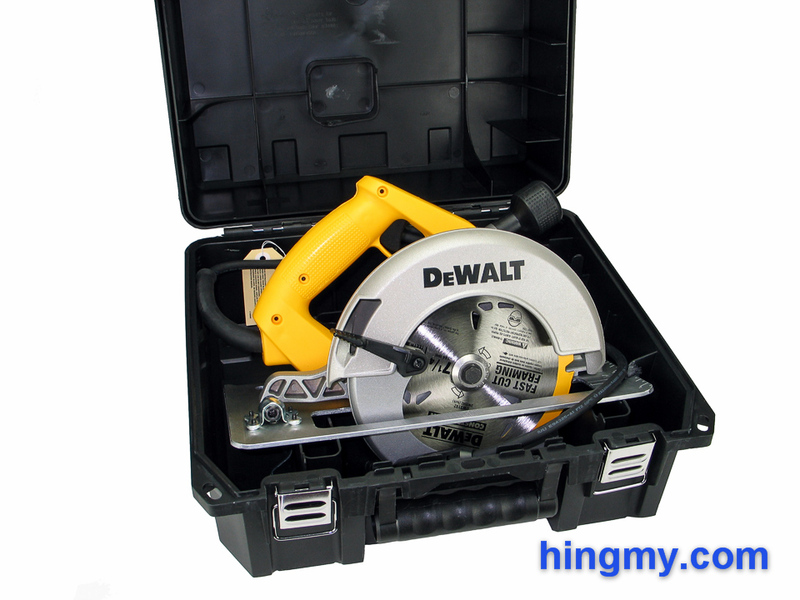 The DW364 is a professional quality circular saw designed for heavy construction use. It will frame houses all day long without needing servicing before the end of the season, and it'll work fast enough to satisfy even the most demanding framer on your crew. To achieve these results DeWalt had to build a saw a level above the mainstream market in terms of quality. 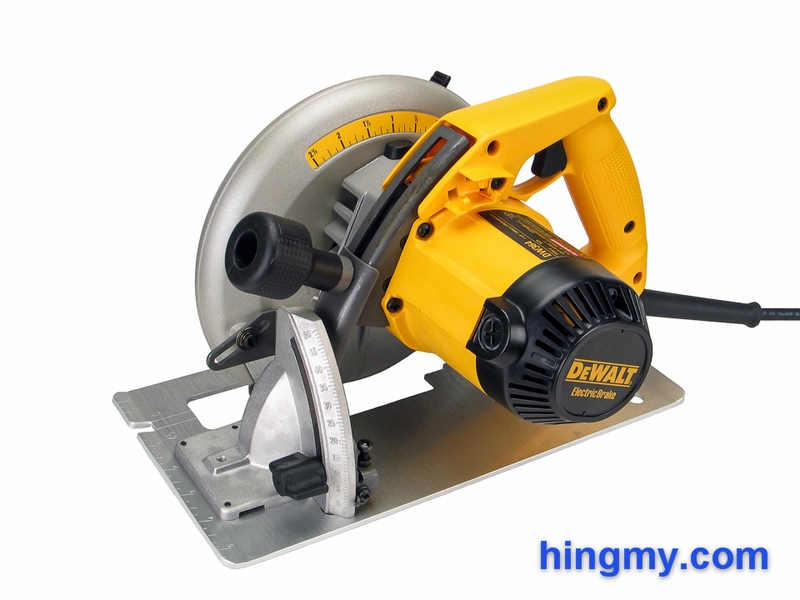 What is plastic or sheet metal on budget saws is made from solid metal on the DW364. The metal housing and blade guards are not the only reason the DW364 is one of the heaviest 7-1/4" circular saws on the market. The plastic covers hide a powerful 15 amp motor that spins the blade at 5,800 rpm, a speed only beat by a couple of saws of the same size. Engineered not only for power, but also durability, the motor appears to draw its rated load continuously, rather than just at startup. The quality of every part of this saw is a notch above the competition. 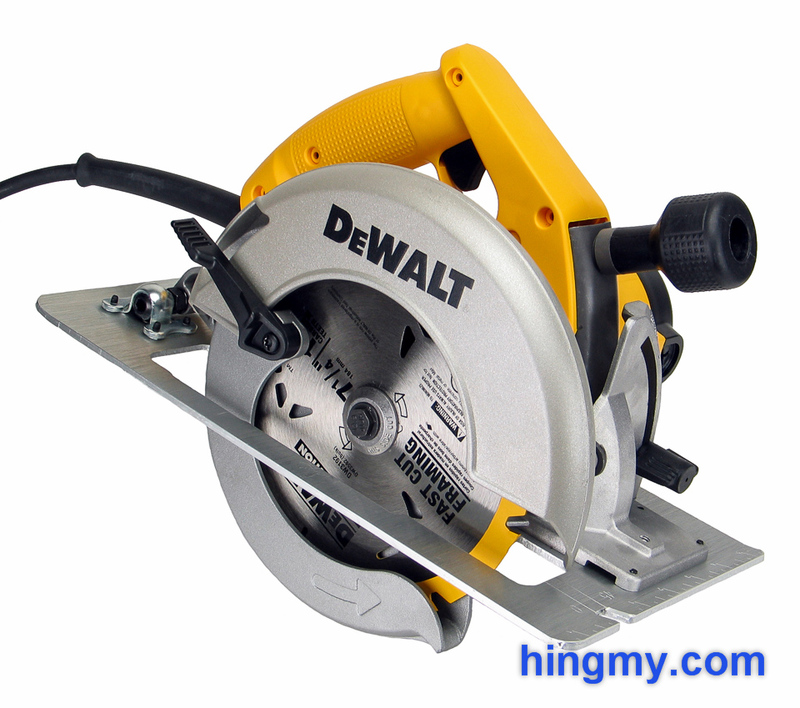 The DW364 is one of the most durable circular saws you can buy. Both the upper and lower blade guard are cast magnesium. There is no play in the way the lower guard moves, which is unusual compared to the build quality of most saws. The control arm for the lower guard is out of reach of the trigger hand requiring two-handed use on some cuts. Most of time, however, the lower blade guard will retract without the operator having to do a thing. The oversize motor brushes hidden behind plastic covers in the motor housing are a good indication of the service life of the DW364. This is a tool that is meant to be repaired when it breaks down. 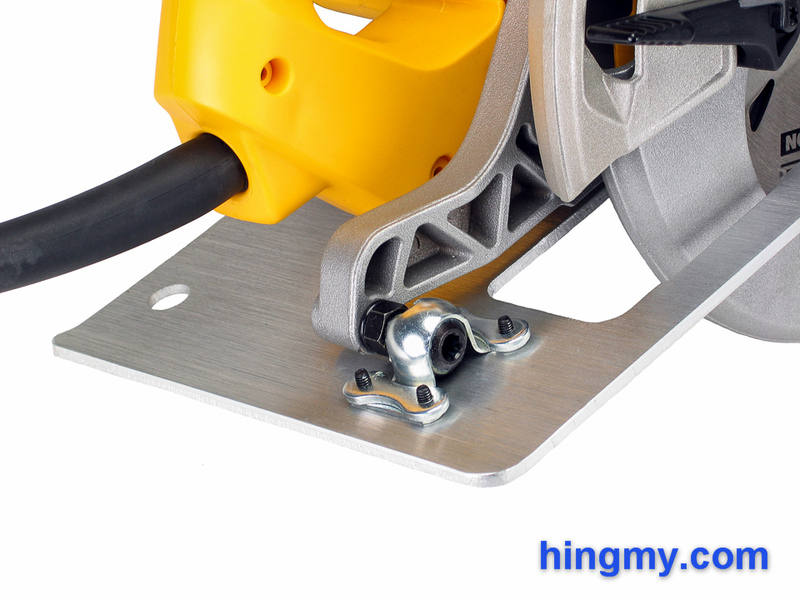 The base plate of the saw is made from a single piece of solid aluminum. Guaranteed to never rust the plate is thick enough to never bend. There is no need for the reinforcing struts found on cast base plates. This minimalist approach gives the DW364's base plate an industrial feel. The plate lets you see what you are working on, while still being strong enough to survive the demands of the job site. A notch at the front of the plate indicates the saw's cutting line at both 0 and 45 degrees. Simply line up the marks on your work piece with either the left or right side of the notch, and your cut will be true. For distance based cuts a scale is engraved along the entire front edge of the plate. Running from + 1-1/2" to - 5-1/2" the scale reads in increments of a 1/2 inch. The numbers can be difficult to read in low light. At maximum cutting depth cuts along a guide fence can only be made on the right side of the blade. The motor overhangs the base plate by a few inches on the left side of the saw. Simply reducing the cutting depth by 1/2" raises the motor housing enough to make room for a 3/4" fence. The saw is equipped with an electronic motor brake, an essential safety and productivity feature. The brake brings the blade to a dead stop about two seconds after the trigger is released. This allows the operator to put the saw down quickly without having to worry about a spinning blade. The brake works as advertised, but produces a bright spark, which is clearly visible through the vent slits in the motor cover. It is not clear to me, if this is supposed to happen, or if the brake on our review model is defective. Either way, the motor brake functions as intended. Turning the front handle in the counter clockwise direction unlocks the depth adjustment mechanism. The motor pivots around an exceptionally well engineered ball joint in the rear of the saw. While the motor moves up, the upper and lower blade guard move down along a separate rail. This ensures that the opening where the upper and lower blade guard meet is always just below the base plate. Tightening the knob back down locks the mechanism in place. The mechanism could not be engineered any better. Even at the shallowest cutting depth possible there is no side-to-side movement anywhere. Heavy metal brackets reinforced in all dimensions ensure this saw stays aligned no matter how rough it is being handled. Loosening the knob takes two full turns to do, which slows the process down needlessly. Once tightened down, however, the knob will stay in place. The depth gauge on the upper blade guard is adjustable for a high level of accuracy. Dewalt needlessly squandered the opportunity to create a truly great experience by only including tick marks every 1/8 on an inch, and making the scale's index marker ambiguous to read. A metal file fixes the marker problem in under a minute, but the overall accuracy of the scale remains at +/- 1/16 of an inch. As a whole the design of this depth adjustment mechanism is well beyond what you will find on mainstream circular saws. It is superior in every way. The DW364 uses the traditional angle adjustment mechanism used by almost all saws, but its implementation is a cut above the field. A cast magnesium bracket at the front of the saw acts as the front hinge. A thumb screw frees the base plate to tilt up to 50 degrees out of square. The same ball joint the depth adjustment mechanism uses acts as the rear pivot point. Like the knob, the thumb screw takes almost two turns to loosen completely. The upside of this is that tightening the screw back down is much easier on your fingers. There is no unwanted base deflection even when we performed our stress tests. The mechanism can be zeroed using a simple screw, which ensures that the saw's only stop, the lowest point of the front hinge, is accurate. A second screw adjusts the index marker making sure the scale reads accurately too. These two features are a necessity on the job site, where knocks and bumps can quickly throw a saw out of alignment. Without this feature you simply cannot trust the scale of any circular saw. Not everything is great, however. There are no stops for common angles. Tilting the saw to any angles besides the two ends of the bracket requires careful positioning of the base plate using the scale. The slow turning thumb screw further slows the process down. Changing blades is no different on the DW364 than it is on most saws. A spindle lock button at the top of the saw locks the arbor in place. This leaves your other hand free to loosen the arbor bolt with the wrench included in the kit. The arbor accepts blades with either a round or diamond shaped cutout. The whole operation is easy enough to complete, but DeWalt does not innovate here. Holding the saw while simultaneously doing several things at once is as cumbersome as it has always been. The DW364 feels like a professional quality saw the second you pick it up. Its weight is your first indication that you are working with something special. When the saw gets to chew through wood this assertion gets validated. The motor powers the saw through construction grade lumber at speeds only a few saws we have tested can match. Some worm drive saws are not as powerful as the DW364. In our endurance tests the saw showed no signs of even working hard. The housing got a little warm to the touch, but little else happened. The motor never sounded labored, even under heavy load. It is very clear to me that the DW364 is an industrial saw designed to work all day long. Both the angle and depth adjustment mechanisms work flawlessly. Setting the saw up for a cut takes a few seconds, but once set nothing on the saw will go out of alignment for the rest of the workday. You can cut miters all day long without having to worry about your saw going out of alignment. The DW364 has no dust collection features to speak of. Almost all dust gets ejected at the rear end of the upper blade guard directly onto the base plate of the saw. Cleanup was unexpectedly easy thanks to the featureless base plate. There are no crevices for the dust to settle into. Most of the dust falls right off when you put the saw down after a cut. The saw produces cuts as square and true as they come. Should anything ever go out of alignment, the base plate can be zeroed to produce accurate results. Tearout is significant on both sides of the cut. The DW364 is a rough cut saw at heart. The DW364 comes with a traditional DeWalt plastic case. The only criticism I can level at the case is that it is not a part of a larger system. When viewed as a single unit the case scores well. It protects the saw from damage and has room for accessories and a couple of blades. Not technically waterproof the case will still keep your saw dry in light to medium rain. Most importantly, the case is square on the outside making it easier to fit it into the bed of your work truck alongside other tools. 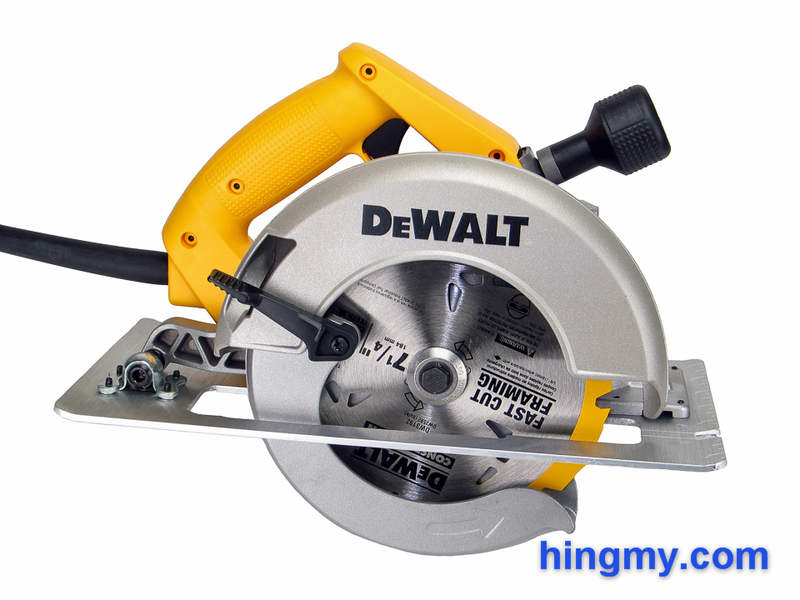 The DeWalt DW364 is simply one of the best 7-1/4" circular saws you can buy. It won't necessarily cut any cleaner than a budget saw, but it is nearly indestructible. Every feature of the saw was engineered to let you concentrate on your work. Handle the saw any way you like, and it'll still make the cuts you need it to. Should things do go wrong, every part of the saw is serviceable. Even considering the high initial cost, the DW364 is likely going to save you money in the long run. The motor brake and fast cutting speed make you more productive to boot. Depth at 90 2 7/16"
Depth at 45 1 7/8"